Имате въпрос към Hotel Grand United 21st Downtown? Независимо дали сте турист или пътувате по бизнес, Hotel Grand United 21st Downtown е перфектен избор за настаняване в Янгон. Хотелът не е далеч от центъра на града - намира се само на 0.1 km от него, а до летището се стига за около 30 минути. С удобното си местоположение хотелът предлага лесен достъп до всички градски забележителности, които задължително трябва да се видят. В Hotel Grand United 21st Downtown отличното обслужване и достъпните съоръжения допринасят за Вашия незабравим престой. Докато са отседнали в този чудесен хотел, гостите могат да се насладят на 24-часов рум-сервиз, безплатен WiFi достъп във всички стаи, 24-часова охрана, магазин за смесени стоки, ежедневно почистване. Хотелът се характеризира с 39 стилно обзаведени стаи за гости, в някои от които ще намерите гардеробна, безплатен чай, хавлии, пантофи, телевизор с плосък екран. Хотелът предоставя най-добрите съоръжения включващи фитнес зала, които ще Ви помогнат да отпочинете след активен ден прекаран в града. Насладете се на несравнимото качество на услугите и престижното местоположение на Hotel Grand United 21st Downtown. Отель расположен в китайском квартале, шумно и грязно, зато есть шанс увидеть настоящую, неотлакированную жизнь города. Номера маленькие, в ванных комната ОЧЕНЬ сильный запах канализации. Персонал плохо говорит на английском, но это беда почти всех отелей в Мьянме. 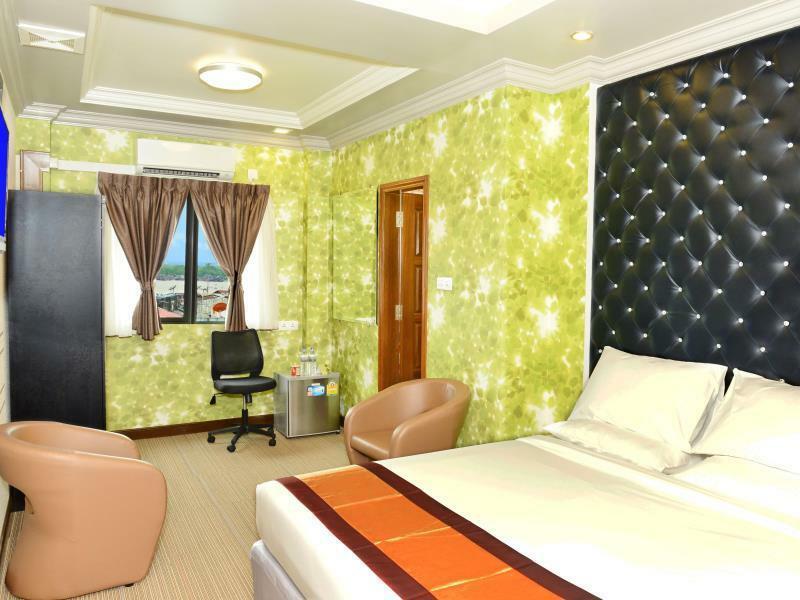 Stayed for two nights, great value for money, helpful staff, perfect location - around 30min walk to Shwedagon and around 10 min walk to Junction Mall and Bogyoke Market. Good breakfast, nice choice for dinner. Recommend! good location. Place is clean & neat. Breakfast area is clean. Food is good. Rooms are well lighted. Cleanliness is our first satisfaction of this hotel plus decent breakfast except hot milk always needed to ask to fill. We're here like a long stay customer, so we got to know most of the staffs in this hotel. Most of them are friendly and understand of the work procedure very well. But on the last day of our stay, a lady at the reception was lied to us to move out another room because they have no more room left and someone is already booked the room we stayed but actually NOT. Since we've already talked to the other guy on the day we checked in and he solved that problem professionally. He looks like an in-charge there and is usually working at the night shifts. Great location which is close by everything. Very clean and no smell even in the downtown. Overall is good. Pros: Good location great breakfast served on the roof top overlooking the skyline Cons: None to complain about I lost my sunglasses thought at the hote, they when to look called me back so they do follow through. Much appreciated as I found them in my travel partners luggage oops ! Staff here are exceptional, kind and helpful. Rooms have all you need and some have a view of Shwedagon Pagoda in the distance. Staff helped book our bus heading south and it was the best we used. Great view from roof top restaurant and food it good. I have stayed here a few times and would definitely recommend it to others. Located at he middle of china town. Walking distance to few attraction. Breakfast is good and at the roof top with great view. Room was clean and come with hair dryer, refrigerant and safety box. You have to bare with the lift which function with a bit slow. Good location, walking distance to anywhere downtown. OK breakfast on a nice rooftop. Poor water pressure in the shower. Good wi-fi (contrary to other reviews, maybe it varies with room). Walking distance to Chinatown, local shops, market and big shopping mall. Good location, clean room, friendly staff, nice rooftop where you get breakfast. Recommended! Location is in the heart of Chinatown, close to restaurants and 19th street. Yangon downtown is similar to downtown at other cities, crowded and not very clean. Plus -cheap -relatively clean for a budget hotel -good breakfast Cons: -a little noisy If you want to stay in downtown, this is a good hotel to stay at. This is a good location, walking distance to the sule pagoda and 17th street(bar street). The staff was great. They helped me get a taxi to everywhere I needed to go. 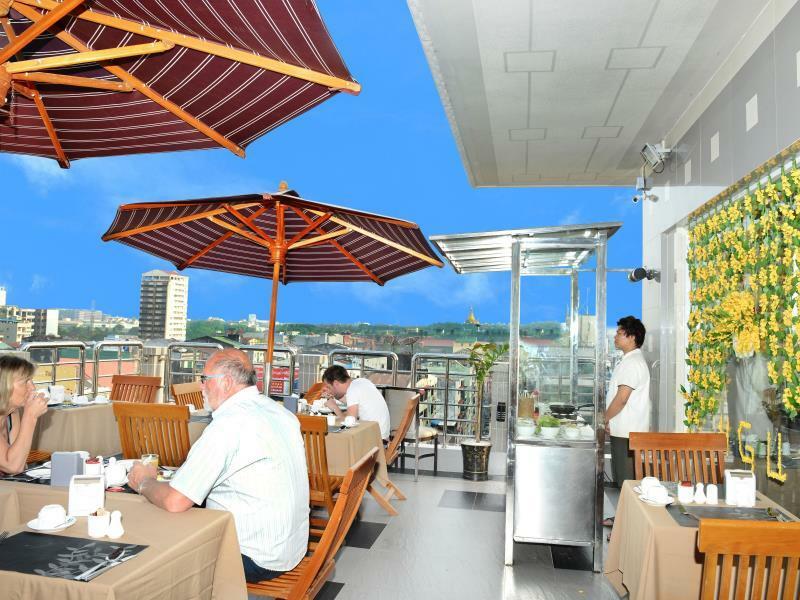 It has a great view of the city and the breakfast was among the best I've had in Myanmar. The rooms were clean and had all the basic amenities. The staff is really helpful, they helped us print stuff and were always friendly. It is located in chinatown near a great sushi place alled oishi! And you can get anywhere in downtown within 10 minutes. Recommend! Everything was good. The location was superb. Near emperor. Near sky. Near 19th street bbq food. There are lots of stuff to buy alot the road. Must try the grass jelly drink at the main St, once out from hotel turn right n turn right on main road. Ah Choy one of the bellboy was friendly and good in suggesting places and stuff to do. He knows how to speak simple Malay. Breakfast was the same stuff... So try eating out if u stay more than a day. Depends on what u wan, u can get rooms with bathtub but the tub is small. Hot water was constant n very hot. Overall a very satisfied stay for me. Rooms were cleaned daily. Superior room was clean and much quieter than I imagined as 21st Street does not appear to have much traffic and the hotel is far enough down the street not to hear the nearby busy Main Street. Only slight negative is hard bed but otherwise great choice for central Yangon. The staffs are really kind and warm. They helped us and organized our sightseeing. Their styile is very hospitalily. In additon, the hotel is very nice and good location. We want to stay again and highly recomend you to stay at this hotel. The Grand Hotel 21st (there are many) is a nice hotel especially for the price. Great breakfast, fun location, nice staff etc. I booked a room with a window, which turned out to a be an incredibly small room, with a cool balcony and window. We had a lot of things, so this wasn't ideal for us. If I did it again, I'd book the cheapest room without a window. My friend did that and had a room nearly twice the size. I'm sure the staff would have changed our room if we requested, but I did enjoy hanging out on the balcony some. Definitely a nice hotel. Clean, comfortable, nice staff etc. have some extra 1000 notes and tip the staff - they'll appreciate it. Room was clean and basic. Best part was a roof top restaurant with a view off the city and the largest pagoda. Staff was helpful in giving advice and setting up a driver around the city and to the bus station. English level of reception was good enough to help with basic advice.